What is the best way to draught-proof stripped wooden floors? You wouldn't leave a window wide open if the heating were on. But if you have stripped floorboards, the chances are that you're doing the equivalent. Cold air naturally circulates below ground floor floorboards, and the small gaps between boards in an average-sized room add up to the equivalent of a small window. No wonder your toes are feeling chilly. According to the Energy Saving Trust, just filling gaps between floor and skirting boards will save around £20 – and 100kg of CO2 – annually, paying for itself in less than a year. A couple of new products claim to let you draught-proof floorboards quickly and neatly, plus there are old-fashioned DIY methods. I gave several a try, starting with Draughtex from Nigel's Eco Store (£23.99 for a 40m roll). This is a squishy, stretchy dark grey sausage available in different thicknesses for different gap sizes. It was very quick to push down into the floorboard gaps, so in theory you could draught-proof a room in minutes. In practice it's more likely to take an hour because gaps can be inconsistent. So you might start off using the thin Draughtex (for gaps up to 3mm), then switch to standard (2-7mm) when the gap gets wider, then revert to thin again. But it's still fairly quick and the results look good – the dark grey blends in with the shadows between floorboards. Next was the equally innovative StopGap (£19.99 for a 40m roll), thin V-shaped plastic that springs apart to stop draughts in floorboard gaps of 1-8mm. This was a revelation. It comes on a tiny roll and, once pushed firmly down into the gap with a credit card, it's invisible. It just looks like the gap's still there. One size fits all widths, so there's less messing about. 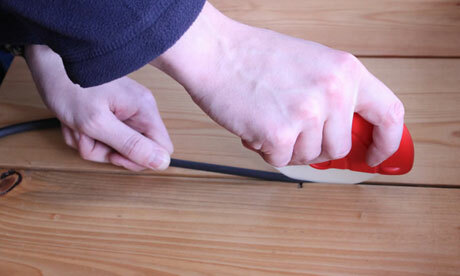 And like the Draughtex, you can use it to fill gaps under skirting boards too. I'd recommend the brown colour as "neutral" looks white when folded, not good between dark boards. If you haven't sanded the floorboards yet, you could use Old Pine Slivers from The Old Pine Company (£35 for 50m, £50 for 100m). This is the gold standard of gap-filling: wedge-shaped laths that you glue and hammer into gaps between boards, before sanding everything down to an even, gap-free finish. I found that although time consuming, the results were excellent and very professional. The slivers are made from reclaimed boards and the company strives to cut waste, turning offcuts and sawdust into fuel briquettes. With DIY options, you're looking for flexibility, so that as the floorboards flex, the filler doesn't crack and fall through the gap. One traditional technique is making papier-mache from shredded newspapers and wallpaper paste. This was messy work, and slower than shop-bought quick fixes, but very cheap. I used B&Q ready-to-use wallpaper adhesive (£5.08 for 1kg) for convenience, but powdered adhesive is even cheaper – with enough time and enough shredded newspapers you could plug every gap in the house for a few pounds. The papier-mache didn't look great though, so I'd only recommend this for draught-proofing in rooms you're going to carpet. But it did work well when covered with a bead of brown acrylic sealant. 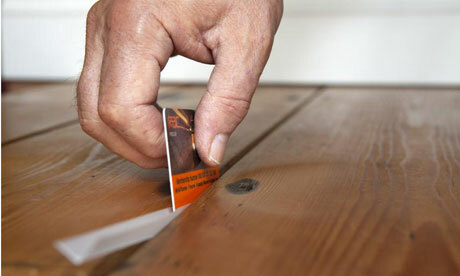 This is another popular DIY option, but the sealant can fall through floorboard gaps if you don't plug them first. I tried two types: B&Q brown interior frame sealant (£4.48 for 310ml) and Bona gap master (£5.45 for 310ml). Both did the job, but the Bona was slightly wetter so easier to work with, and a little went a long way. Also, specifically aimed at flooring, it's available in 14 different wood colours. (If you do decide to buy generic frame sealant though, make sure it's acrylic not silicone-based; acrylic is easy to clean up, sandable and overpaintable.) This method was also great for holes around radiator pipes and other random filling. By the end of the test, I had a well draught-proofed floor, albeit using six different methods. An infrared thermal leak detector confirmed that they all worked. Before the test, every gap measured 0.5C colder than the boards themselves. Afterwards, the temperature was consistent all over and the floor felt less draughty. But which methods bared repeating? For ease of application, StopGap wins hands-down. For still-to-be-sanded floors Old Pine Slivers gives a perfect finish. 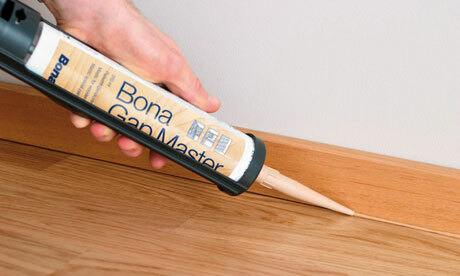 And Bona gap master plus papier-mache is best for tight budgets and funny-shaped gaps. Making friends by swapping skills! Royal chef swaps favours and her hubby gets one back! Welcome to the new Swapaskill site! SKILL SWAPPING IS THE NEW TREND!